Skeleton is one of the most intense sports you’ll find at the Winter Olympics, with athletes flying at up to 144 km/h per hour down an icy track. 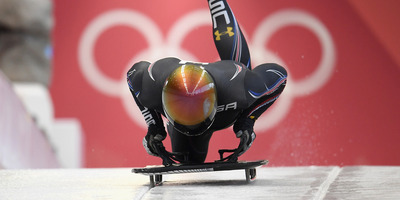 American skeleton rider John Daly recently gave fans a first-hand look at what it feels like to fly down the mountain like a pro. Daly lost control of his sled in his final run at Sochi 2014, and will be looking for redemption and a medal at Pyeongchang. Skeleton is one of the most exhilarating and death-defying events of the Winter Olympics. Athletes sprint at full speed, leap onto their small sled headfirst, and tuck in to gather as much speed as they can as they fly down the icy track at breakneck speed. Daly also gives would-be skeleton riders some advice on how to avoid disaster during competition. You can watch a video of Daly’s run below. Daly lost his shot at a medal at Sochi 2014 after losing control of his sled on his final run of the competition. He’ll be back in action in Pyeongchang looking for a shot a redemption.